I’m a fan of holidays in general, but I particularly like the 4th of July. I am so grateful to live in a country where we can enjoy the freedoms that we do. I feel like the world has been a little topsy-turvy lately, which just makes me appreciate this country’s history and the Constitution even more. With celebrating, comes decorating ;). And the kitchen is definitely one room in the house that should never be neglected during decorating time- because we tend to spend more time there during the holidays anyway, right? ;) But you don’t have to go out and spend a ton of money to have a decked out kitchen! Here are a few easy ideas to put some “sparks” in your kitchen ;). Mason Jars. Oh how I love mason jars. You probably already have a few hanging around in your kitchen, so just paint a few and throw in some fresh (or fake ;) ) flowers for an easy centerpiece. 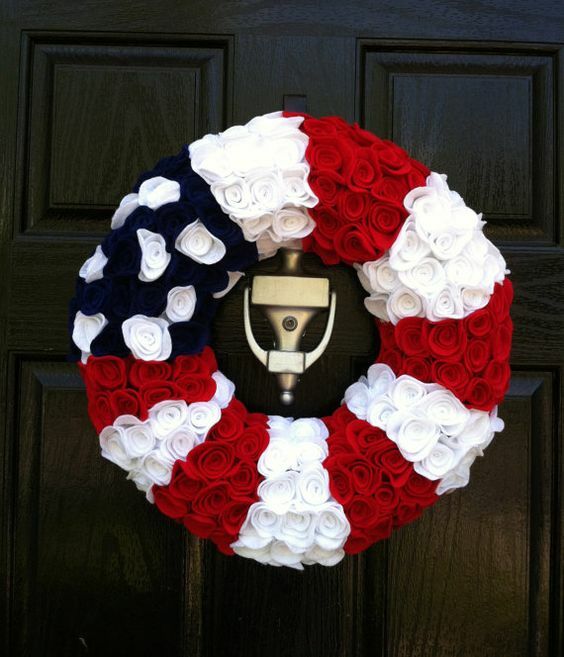 You could do red, white and blue solids, red and white stripes with a plain blue one, and even throw a few stars in if you’re handy with a brush (or have a stencil;) ). 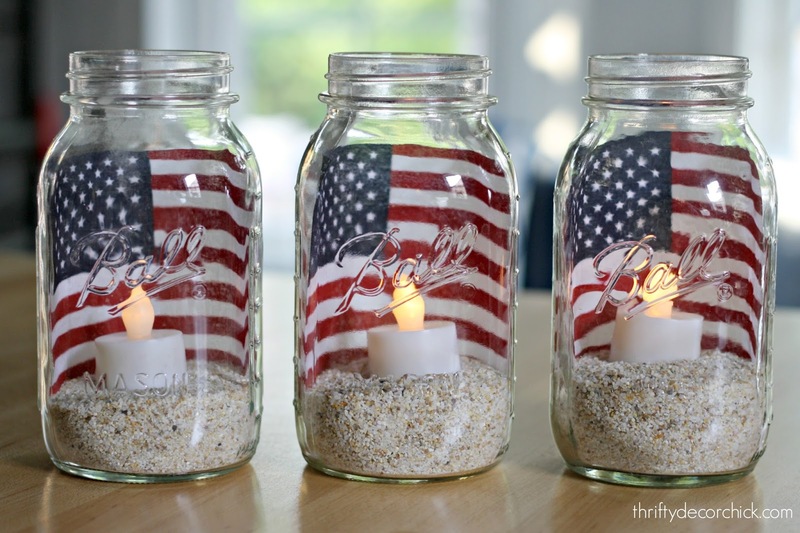 You could also be a little more unique and stick sand and tea lights in each jar with a picture of the flag behind it- so so creative! 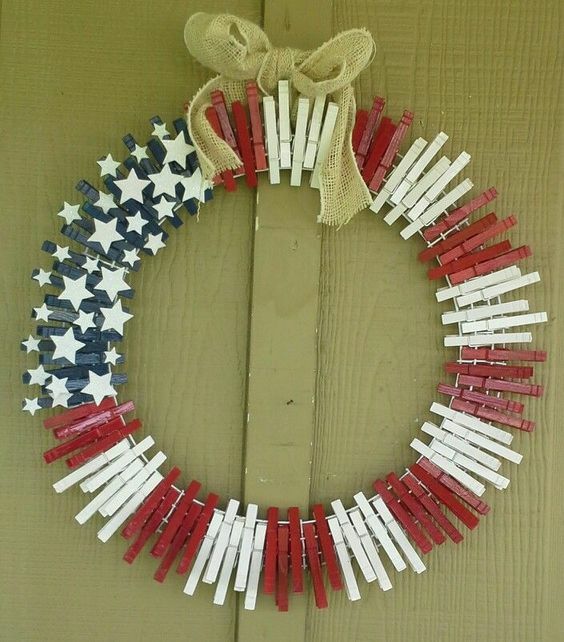 Clothespin wreath. I love this so much. Spray paint a bunch of clothespins and pin them to wire and you have pretty much the easiest wreath ever- but still so darn cute. Felted rose wreath. 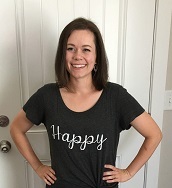 I have made these before and while they are a ton of work, they are so worth it! You could use different shades of colored felt to create a more rustic looking wreath or stick with bright festive colors. There is no right or wrong way to do these! They’re all just darling;). Pallet Flag. 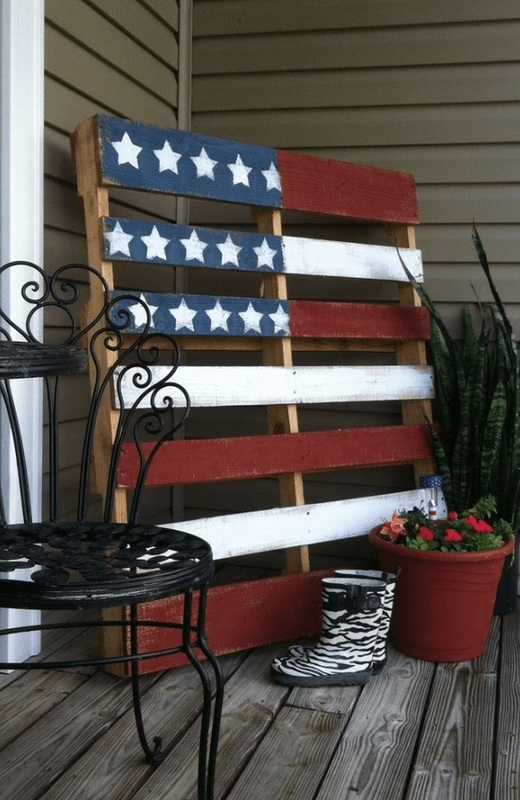 If you have a large enough kitchen (or you could just use your porch;) ), use a spare pallet and some paints to create this beautiful, fun flag. This is totally my style! I love reusing old things, don’t you? Bandana Tablecloth. If you’re into tablecloths, a really fun and simple way to get a 4th of July themed one is to sew a bunch of bandanas together into one giant bandana tablecloth! Why is it that bandanas are so 4th of July-ish? :). Simple, yet effective! Candy Centerpieces. And of course, there’s always the colored treats in a jar trick;). I love this particular combo- red vines, white chocolate covered pretzels and blue M&Ms. My only problem would be not eating everything before the 4th of July arrives ;). These are just a few ideas you could incorporate into your kitchen. I’d love to hear what ideas you have in the comments below! Whatever your kitchen looks like this holiday;), I hope you all have a wonderful and safe Independence Day!